Rabbi and Talmudist; born, 1796, in Baiersdorf, a small town near Erlangen, the birthplace of a number of prominent Jews; died at Munich, 1876. He studied in Prague and became known as a Talmudist. 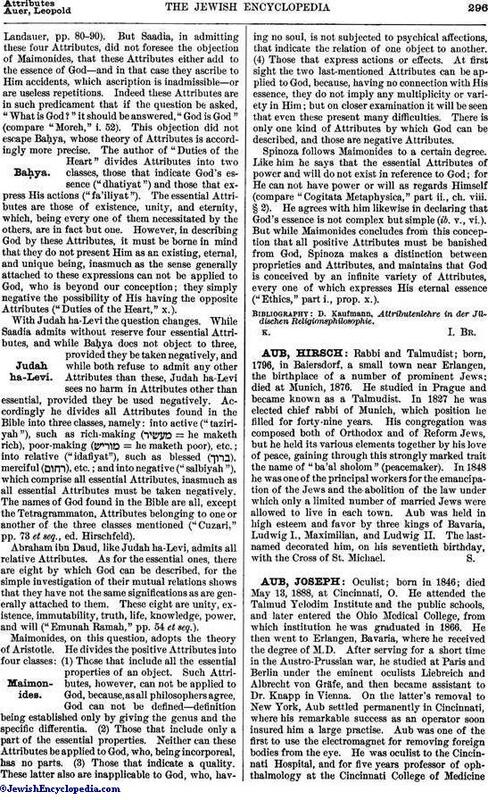 In 1827 he was elected chief rabbi of Munich, which position he filled for forty-nine years. His congregation was composed both of Orthodox and of Reform Jews, but he held its various elements together by his love of peace, gaining through this strongly marked trait the name of "ba'al sholom" (peacemaker). In 1848 he was one of the principal workers for the emancipation of the Jews and the abolition of the law under which only a limited number of married Jews were allowed to live in each town. Aub was held in high esteem and favor by three kings of Bavaria, Ludwig I., Maximilian, and Ludwig II. The last-named decorated him, on his seventieth birthday, with the Cross of St. Michael.